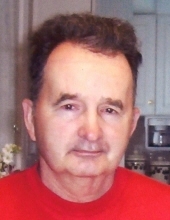 David A. Martin, 81, of Terre Haute passed away Sunday, February 3, 2019 in his residence. He was born January 14, 1938 in Terre Haute to Earl Martin and Lenora Gess Martin. Survivors include his sisters, Bertha Wolfe, Alice R. Johnson, and Betty Boatman; and several nieces and nephews. He was preceded in death by his wife, Elnora Martin; his parents; and siblings, Joseph Martin, Brice Martin, and Mary Lee. David was a Navy Veteran and retired from Highland Lawn Cemetery. Funeral services will be conducted at 11:00 A.M. Friday, February 8, 2019 in Callahan & Hughes Funeral Home, 605 South 25th Street, with Reverend Tim Fagg officiating. Burial will be in Grandview Cemetery with Military Honors. Visitation is scheduled prior to services from 9:00 – 11:00 A.M. on Friday. To send flowers or a remembrance gift to the family of David A. Martin, please visit our Tribute Store. "Email Address" would like to share the life celebration of David A. Martin. Click on the "link" to go to share a favorite memory or leave a condolence message for the family.